Shelton Mindel & Associates are one of my favorite architects of all time. They constantly produce crisp, clean and innovative interiors that exude modernity and yet feel cozy. Residence 5504 is just one example of their inspirational portfolio. I love the juxtaposition of the clean smooth white wall anchoring the grey stone with white veining fireplace. The horizontal niche flanking the vertical fireplace is also a brilliant touch. 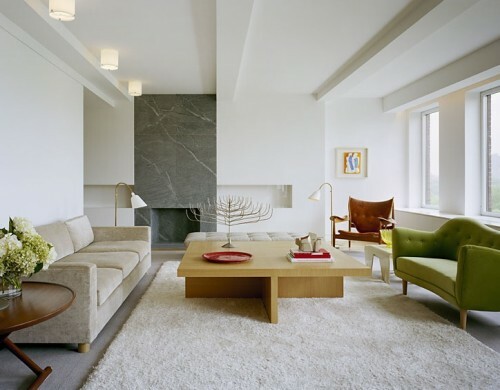 The green Finn Juhl sofa adds burst of color and vibrancy yet is consistent in evoking a sense of calmness. I LOVE these white leather bean bag chairs from Zanotta! They are inviting and look so comfortable. The chandelier is Jean Royere design. I love the Hans Wegner Flag Halyard chair with the red pillow. 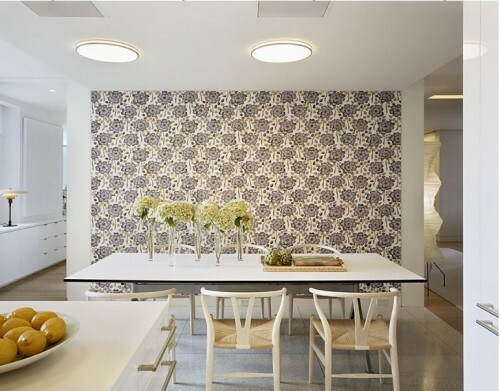 The wallcovering is Josef Frank and the chairs Hans Wegner wishbone chairs. The wallpaper adds a fun groovy vibe against the otherwise pale serene color palate. What a fun painting idea! The paneled bleached walnut wall behind the bed adds warmth. I adore this burnt sienna throw from Susan Chalom designed by Karin Lilja-Makkonen, it echoes the warmth of the walnut wall. Poul Kjaerholm chairs along the sidewall with a 1959 work by Lars Englund above.